I visited Dante’s Viewpoint in Death Valley National Park during February. The huge size of the valley can be readily appreciated from this viewpoint since it sits 5,475 feet above sea level and Badwater Basin on the valley floor below is 282 feet below sea level. Thus, the camera is located substantially more than a mile (5,757 feet) above the valley floor and the floor is more than six miles wide. I had been photographing bright, sunlit scenes on the valley floor for a few days and was happy to see a different view when I arrived at Dante’s Viewpoint shortly after daybreak. Directional light from the rising sun, shadows from clouds and heavy atmospheric haze created a softer, more surreal view of the park than I had seen during the previous days. Light snow had fallen during the night at higher elevations in the park so I included snow in my composition to strengthen the foreground tones and provide contrast with the hot valley floor. The atmospheric haze weakened shadows on the valley floor and obscured mountain features across the valley. Since shadows and mountains were important parts of the scene, I decided to strengthen their tones during exposure. The next question was, “How much strengthening was needed?” My goal was to reduce the effects of haze enough to darken tones in the valley and mountains but still maintain enough haze in the photograph to provide a visual cue to the huge size of the valley. Fortunately, I was using black & white negative film so I could take advantage of its ability to vary the gray tones on film that are associated with colored portions of a scene. For example, warm-colored filters transmit plenty of warm light but absorb much of the blue light so blue areas of a scene are exposed less on negative film and appear darker when the negative is scanned or printed. Since haze, shadows and cloudless sky are often quite blue, warm-colored filters are commonly used to darken the gray tones of those areas on black & white film. To select the appropriate filter today’s scene, various colored filters were placed over my spot meter and the gray values that were produced for a foreground object (no haze) and mountain area (much haze) were noted. The difference between the two gray levels showed how much each filter darkened the mountains across the valley compared to the foreground. 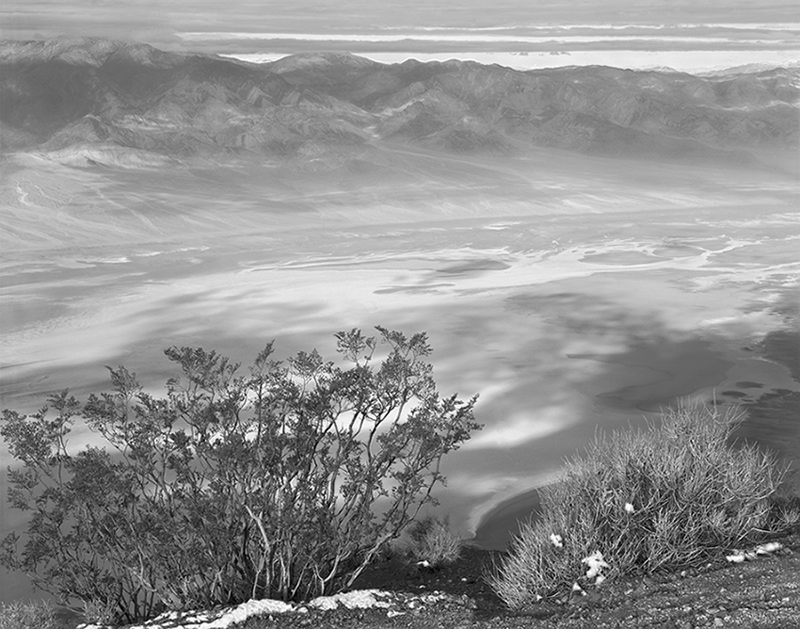 A dark yellow filter was found to cut enough haze to reveal structure in the mountains but retain a suitable amount of haze to communicate the huge size of the scene. I mounted a 210 mm lens on my 4 inch x 5 inch view camera (150 mm is a “normal” focal length for 4×5 cameras) and composed an image. Communicating the huge size of the valley was enhanced by including bushes very close to the camera to contrast with the mountains located several miles away. View cameras provide a major advantage in situations where sharp focus through a large distance in the scene is required. This is accomplished by tilting the front or back of the view camera to position the lens’s focal plane so that it covers both foreground and distant objects. Positioning the focal plane efficiently in this manner greatly reduces the amount of depth-of-field that is needed by stopping down the lens aperture. This has the added benefit of producing a sharper photograph since a less-sharp f-stop (a very small f-stop) can be avoided. For today’s photograph, I tilted the camera lens until its focal plane was positioned on the bushes that were located a few feet from the camera and the mountains across the valley. A dark yellow filter was attached to the camera lens and one photograph was acquired using Tri-X black & white negative film exposed at 1/15 sec and f/32. The film was developed normally. The 4 inch x 5 inch film was scanned at my usual resolution of 5,000 pixels per inch and 16-bit pixel depth to obtain a high-resolution digital image. Opening the digital file in PhotoShop showed that a good range of gray tones had been captured on the film but the image looked a bit flat. The image obtained from the scanner without editing is shown below. As I often do with a new image, my first editing task involved opening a Levels Adjustment Layer to explore tones in the photo. 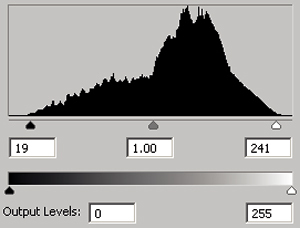 PhotoShop’s Levels Adjustment interface provides image histograms and the gray-level histogram is provided below with dark-to-light tones of the histogram displayed from left-to-right. The histogram shows that few pixels occupied very dark or very bright tones. The black and white sliders were moved as I watched the image to identify desirable tones for various parts of the image. This is akin to printing a test strip during conventional darkroom printing to identify appropriate exposures for different parts of a film. Exploring the image in this manner helped me see that the presence of light in the foreground should be strengthened substantially, shadows on the valley floor should be darkened a bit and structure in the mountains should be enhanced. The Levels adjustment provides only a global edit, however, so I made a note to perform local enhancements later and settled on the best overall global adjustment for now. The black slider on the left was moved from 0 to 19 to strengthen dark tones while the white slider on the right was moved from 255 to 241 to strengthen bright tones. Those adjustments stretched the histogram in both directions and increased overall image contrast. In particular, the presence of sunlight and the strength of shadows were improved somewhat as the following image shows. Next, a Curve Adjustment Layer was opened to modify pixel tones in specific parts of the image. 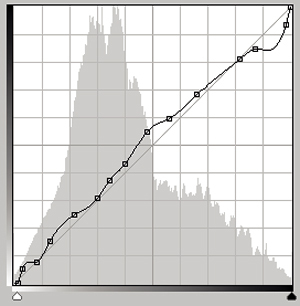 The user interface for curve adjustment is shown below with tones that progress from light-to-dark beginning at the lower left corner (note that tones in the histogram shown previously varied from dark-to-light beginning at the lower left corner). Gray tones in four image areas were targeted and will be discussed briefly, beginning at the dark end of the histogram (the upper right corner). The image foreground felt too heavy. The “finger” in the curve interface (not shown here) was used to sample the image to identify the section of the curve that corresponded to heavy foreground areas. I found that those pixels were associated with nearly black shadow areas so I clicked and dragged the finger downward to lighten those pixels by bending the appropriate section of the curve downward. The adjustment can be seen as a dip near the dark end (upper right) of the curve. Note that pure black pixels remained pure black even though pixels that were nearly black were brightened moderately. Next, shadows on the valley floor were strengthened slightly to increase their visual weight. The “finger” identified that important shadow pixels were located near the middle of the curve so that section was bent upward to darken the shadows. The adjustment can be seen as a broad section of the curve which is centered on middle-gray. Third, some bright tones on the valley floor and foothills across the valley were darkened slightly to emphasize structural features in those areas. A fairly broad section near the white end of the curve (lower left) which corresponded to those light-gray pixels was bent upward. The last image areas that were modified with the curve adjustment were the extremely bright areas in the sky. The “finger” indicated that pixels associated with those areas were clustered in a small section of the curve that was adjacent to pure white. That section was bent upward to darken the bright sky areas slightly. The effect of curve adjustments on the image is shown below. It shows that foreground heaviness was reduced, shadows on the valley floor were strengthened slightly, textures in bright areas of the valley floor were improved, textures in the foothills were improved, and the brightest areas of the sky were slightly darkened. Note that curve adjustments provide a powerful way to make numerous image edits at the same time. Last, local retouching was performed using PhotoShop’s Burn, Dodge and Clone tools. The original image layer (image from the scanner) was duplicated, named “Retouch” and placed directly above the original layer. Attention was directed first to the foreground. PhotoShop’s Dodge tool was used to brighten many of the lightest areas of the foreground to increase the presence of morning sunlight. Next, the mountains were retouched to reveal their structure more readily. The darkest mountain areas were darkened with PhotoShop’s Burn tool and the lightest areas were brightened with the Dodge tool. Alternatively, a warmer filter could have been used during exposure to accomplish the same thing. That is, an orange filter rather than a dark yellow filter would have removed more blue haze and revealed more mountain structure on the film. Using different filtration during exposure to obtain more correct tones on the film is preferable to changing incorrect tones during editing since images are usually technically better when correct tones are obtained sooner rather than later. Finally, attention was directed to the edges of the photograph. In general, it is preferable to keep viewer’s eyes on a photo rather than letting eyes fall off of the edges of a photograph. First, the thin strip of bright sky on the right half of the top edge of the image was darkened to reduce its visual strength. Next, numerous small image features near the other image edges were burned or dodged to reduce their visual strength. The following image contains all of the previous edits. It can be compared to the previous image to assess the success of keeping viewer’s eyes on the photograph. I made a 16 inch x 20 inch digital inkjet test print and set it aside for a couple of days while my mind cleared. When I finally took a look at the print, I thought that it looked good. Details from the valley floor and mountains are more easily visible in large prints so I prefer larger prints more than smaller ones for this photograph. The subject of this photograph is an early morning view which shows the huge scale of Death Valley from Dante’s Viewpoint. Any comments you might have about the image, the photographic approach used for it, its composition, or image workup will be appreciated. For a larger view of this photograph, visit here.